Motoori House (本居宣長旧宅) is one of the traditional houses located in Matsuzaka, Mie Prefecture. Motoori Norinaga is the famous scholar and doctor who wrote the annotation of Kojiki and Genji Monogatari. 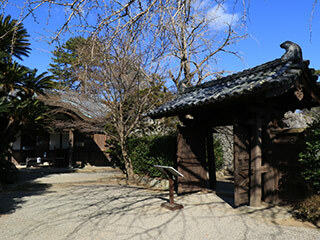 This house was constructed in 1702 and remains the great condition of the house in Edo period. Therefore, it is registered as the special national historic site. There is his museum located next to this house. Admission: 400 JPY for Adult, 300 JPY for students, 200 JPY for kids. Motoori Norinaga lived when he was 12 years old to 72 when he died. This house was constructed for his great grandmother in 1702. Norinaga moved this house in 1741 and removed to this place in 1909. It remains great conditions of the old traditional Japanese house in that era. There is a museum that displays many of Norinaga's artworks and books.